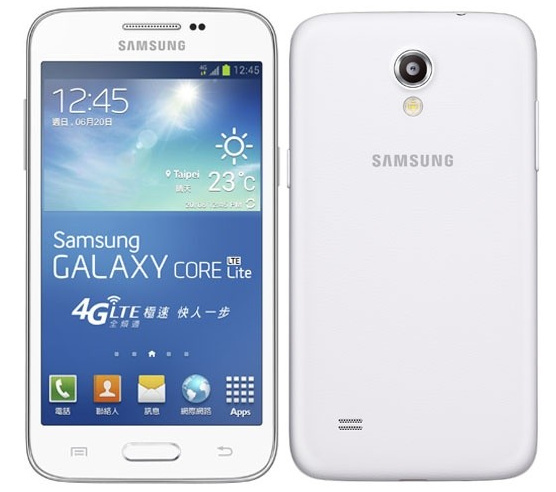 Samsung Galaxy Core Lite LTE SGH-T399 has been announced for a price of NT$ 7988 ( US$ 266 / RS 1600 India ) in Taiwan. The Galaxy Core Lite SGH T399 comes with a 4.7 inch WVGA LCD display and Android 4.3 operating system. The main attraction for the phone is LTE / 4G support. Samsung has not clear if it will launch the T-399 Lite outside Taiwan. The Galaxy Lite Core LTE T-399 is accomplished with 5MP primary camera with LED flash, but lacks the front facer. It gains the power from 1.2GHz 4-core Snapdragon 400 CPU powered by 1GB of RAM and 8GB of Internal Storage. It supports LTE in 900 MHz ( BAND 8), 1800 MHz (BAND 3) and 700 MHz (Band 28). The Samsung Galaxy Core Lite will be available in White and Black colors.